Did you watch the premiere of Descendants 2 this past week? My kids and I have been counting the days all summer to see Uma, the daughter of Ursula seek revenge from the Isle of the Lost. I love that Disney is having fun with villains in this musical trilogy. The cast of characters include the children of Ursula, Maleficent, Jafar and more. There's an abundance of dancing, singing and references to our favorite Disney movies! The Rise of the Isle of the Lost features a lot of attention on the sea and Uma. I wanted to create a spooky and bejeweled series of cookies for our Descendants 2 party. 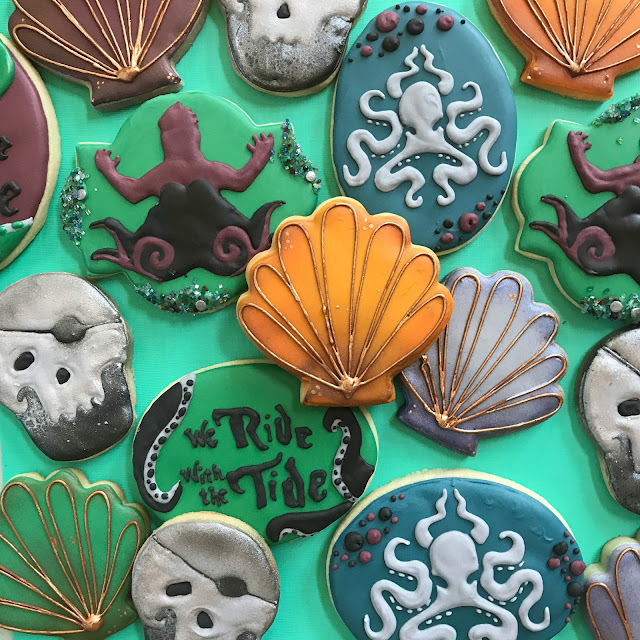 I focused on jewel toned seashells, sparkly skulls and of course an abundance of octopus! Are you hosting a Descendants party? You can recreate this set easily and I bet you have most of the cutters already! 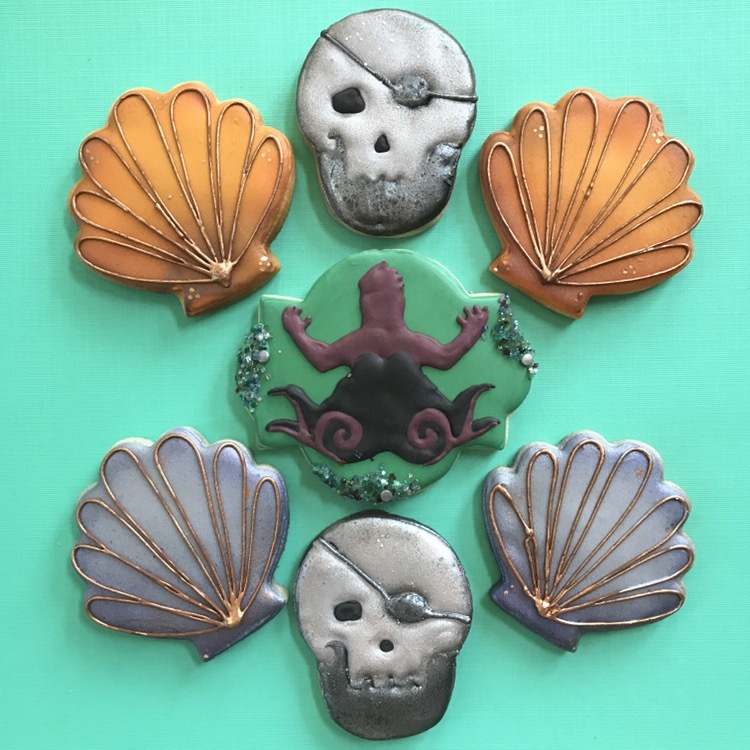 For this cookie set I used : shell, oval, plaque and skull. This cookie party platter could also be easily tweaked to just be for a pirate party. 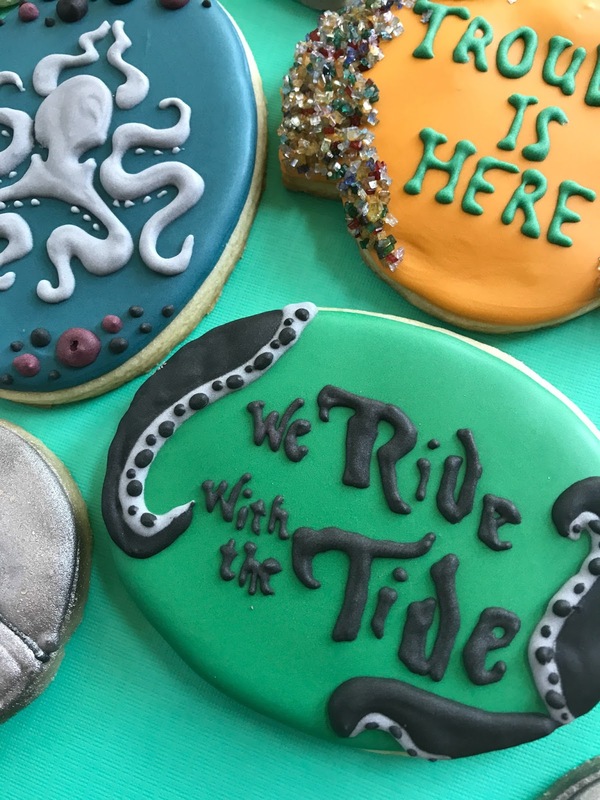 One of the catchy series phrases was "We Ride With the Tide" and "Trouble is Here". 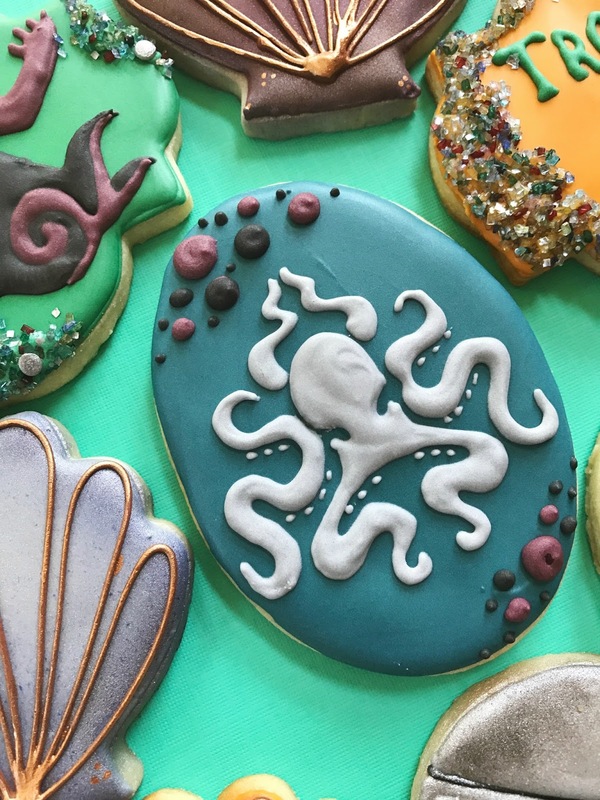 One of my favorite cookies features a quote and is framed with octopus tentacles. This is an easy cookie to make and can be done on just about cookie cutter you have at home! You can see below how much the jewel toned sugar sprinkles add to the cookie set. They shimmer and glisten like stolen jewels from the sea. Your Descendant loving kiddos will go nuts over these treats! Come watch me create the cookie over here! So easy on a basic plaque cookie. What's a story of the sea without pirate skulls and an evil octopus villain? I created these ombre jewel seashells with the help of my airbrush machine and some edible gold paint. Come back later this week to see how I made the shells and used them in a desert beach set!